We can hear the chorus of protests about how cash is not a hedge against inflation. Tell it to the judge – by which we mean the only judge that counts – the evidence. 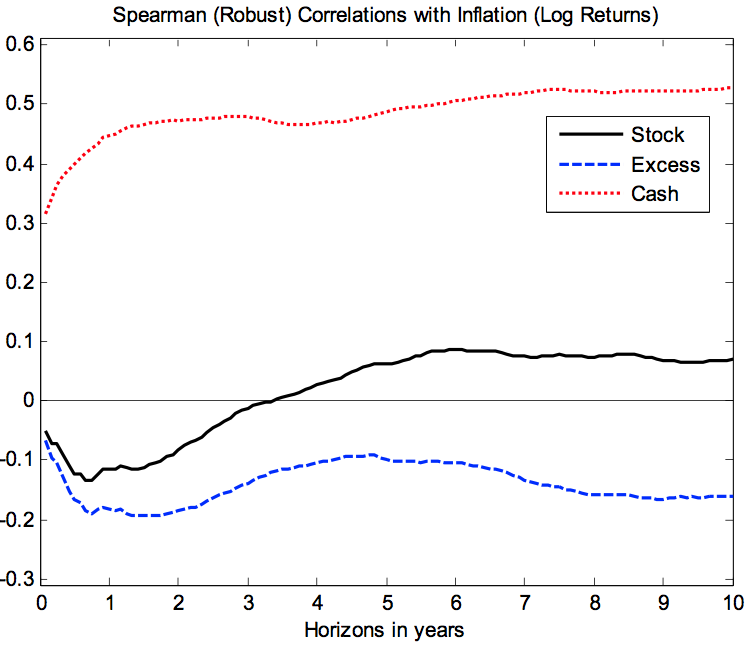 The following chart, taken from Ang’s recent chapter on forecasting stock market returns, illustrates the correlation between inflation and the returns to cash and stocks over horizons from 1 month to 10 years. Note from the chart that equity returns in excess of cash (T-bill) yields are negatively correlated with inflation for at least 10 years after an inflation shock, while cash returns adapt quickly to changes in inflation. Chart 1. Correlation of excess returns to cash and stocks with changes in inflation. The U.S. market has experienced at least three of the four states above since 1970. 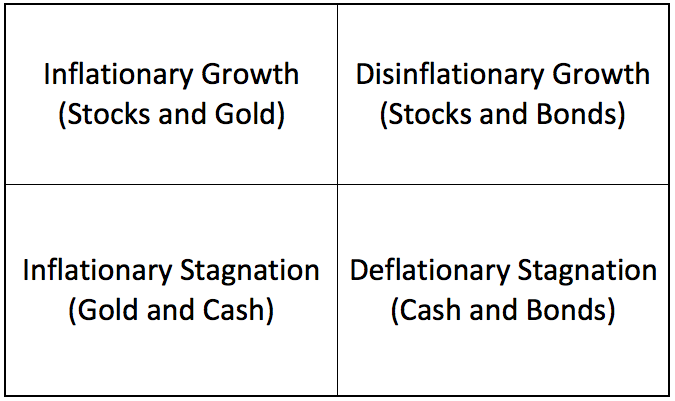 The 1970s was clearly a period of inflationary stagnation (stagflation), where commodities, gold and extremely short-duration bonds were the only sources of positive returns. This was followed by an intense and prolonged period of disinflationary growth from 1982 through 2000 which saw U.S. stocks compound at rates above 15% annualized for almost two decades. Long duration Treasury bonds also performed very well in this period as rates dropped from 15% in 1981 to 5% in 2001. After 2000, aggressive central bank priming succeeded in creating a period of inflationary growth which ended in the Great Financial Crisis of 2008. This period was dominated by commodities, gold, and the markets of those emerging economies that benefited from high commodity prices. We have no confidence whatsoever in defining the state of current markets, though we suspect we may experience a period of deflationary stagnation in the intermediate term before all is said and done. 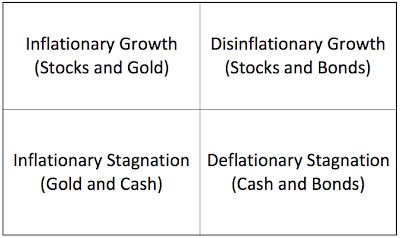 Periods of deflationary stagnation are (so far) quite uncommon in the modern era, and especially among developed economies for which we have accurate and granular data. The one prominent standout is, of course, Japan which began its period of deflationary stagnation in 1990 after the coincident bursting of the Japanese banking, stock and property bubble. Deflation is a period of falling prices, and Japan offers plenty of examples of this phenomenon over the last 20 years or more. 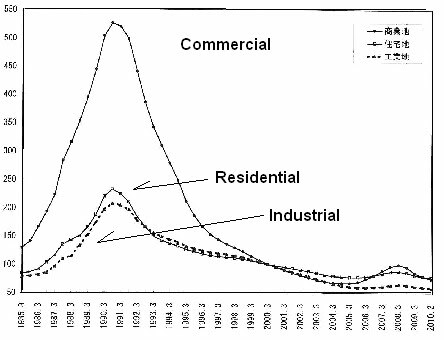 As seen in Chart 2 below, commercial real estate prices experienced the most profound bubble, rising by almost 4x from 1985 through 1990, but residential real estate also tripled in price over the same period. Over the subsequent 22 years, commercial property collapsed to half the value it went for in 1985, and residential real estate currently goes for about the same price it went for almost 30 years ago. The story of the Japanese stock market is now very well known. Japanese stocks (Nikkei) dropped almost 80% from 1990 through their interim bottom in 2003, and then dropped further to their bottom in early 2009. Total returns to Japanese stocks over the period were -5.29% annualized, for a total return of -71% through June 29, 2012. 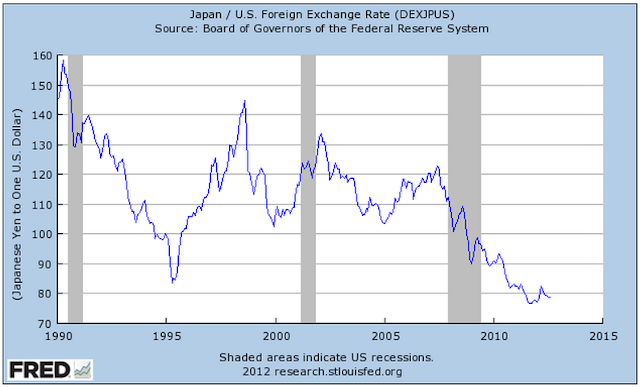 Despite the best efforts of the Bank of Japan to debase their currency (and re-inflate asset prices) through extensive quantitative easing over the past 20+ years, the Yen has appreciated strongly, moving from almost 160 yen to 1 U.S. dollar in 1990 to under 80 currently (i.e. 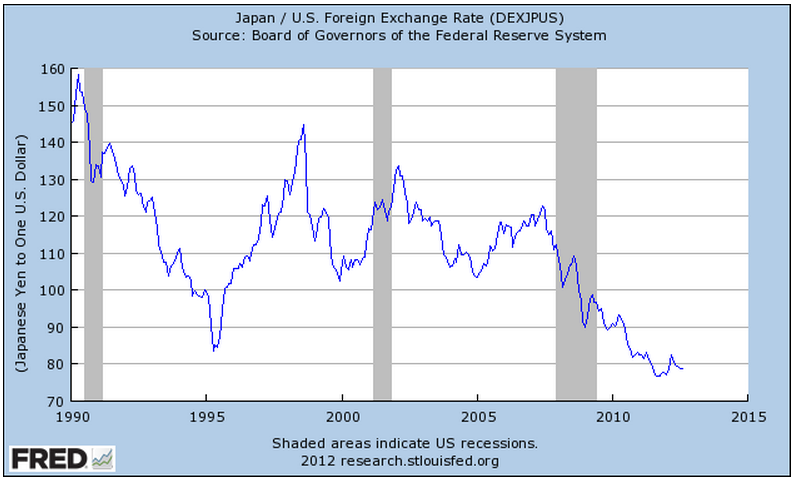 one dollar can purchase half as many yen today as in 1990, so the yen has doubled in value vs. the dollar). The strength of the yen has complicated efforts to diversify into alternative global asset classes, which are mostly denominated in dollars. The following chart (Chart 5.) of gold in yen highlights this challenge for Japanese investors. While gold’s strength since 2000 has swamped yen strength, investors endured a 57% drawdown over the first 10 years, and did not break even on their investment until 2005! Intuitively, given the poor performance of Japanese stocks; extremely low short term interest rates over much of the last 15 years, and; yen strength eating into dollar denominated assets like gold, the Japanese Permanent Portfolio was not nearly as fruitful as the U.S. version. Note: The daily total return data for Japanese asset classes that we use in this analysis deviate somewhat from other similar studies of the Japanese Permanent Portfolio that we’ve seen. While we have done our best to source and, in the case of interest rate indices, transform the data appropriately, the absolute performance numbers of the strategy are, in our opinion, less important. Rather, we are much more interested in validating (or not) the risk management techniques we proposed in our earlier Permanent Portfolio Shakedown Part II, in the context of a Japan’s very different market environment. Clearly the Japanese Permanent Portfolio (PP) delivered much better total returns over the past 20 years than the Japanese stock market on its own, and indeed performed better than the traditional Japanese 50/50 stock bond portfolio that we explored in great detail in Rebalancing Japan. In examining the impact of volatility management on the Japanese Permanent Portfolio, we will follow the same investigative trajectory that we followed in our original Permanent Portfolio Shakedown Part II for the next series of case studies. Note that, while the original Japanese PP exhibited an average volatility of about 8% annualized, we will stick with 7% portfolio volatility targets in order to be consistent with the original U.S. based articles. 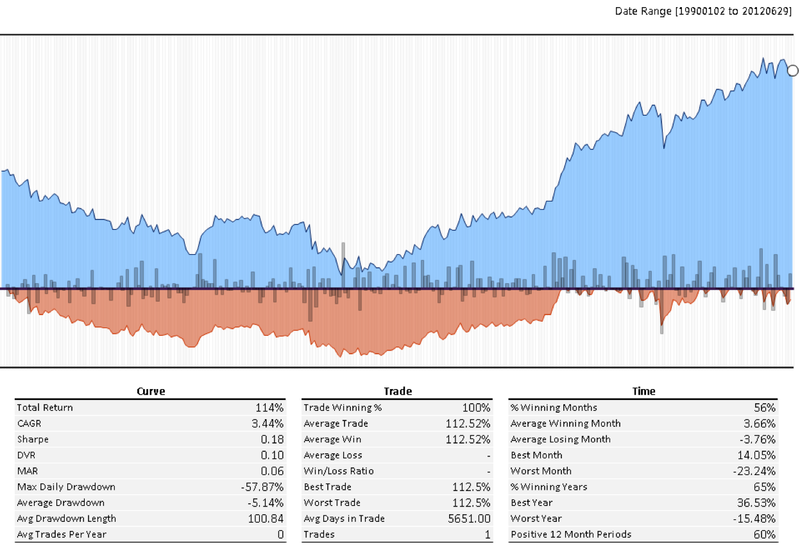 As a reminder, we target portfolio volatility by measuring the volatility of the portfolio at each rebalance period, and adjust total portfolio exposure lower if observed volatility is too high by substituting t-bills. The first case maintains equal portfolio exposure to all four assets, but reduces pro-rata exposure in response to expanding portfolio volatility. 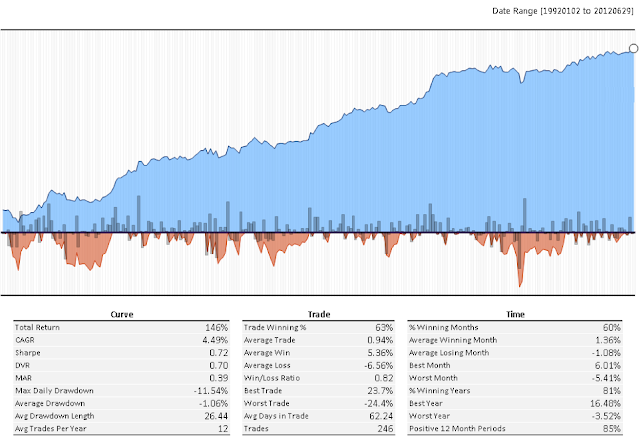 In our experience, the primary utility of managing portfolio volatility to a target is a reduction in drawdowns and increase in Sharpe ratio, with a very small sacrifice to absolute returns. The Japanese PP outcome is consistent with this observation, as Sharpe ratio increases slightly while drawdown drops substantially to 13% from 22%. The next step is to migrate to an equal volatility allocation instead of the equal capital allocation example in Chart 7. Adherents to the risk parity philosophy aim to create portfolios where each asset class contributes an equal amount of volatility to the portfolio rather than an equal amount of capital. Chart 5. approximates a risk parity approach using stocks, gold and Treasuries, with a 7% risk target. 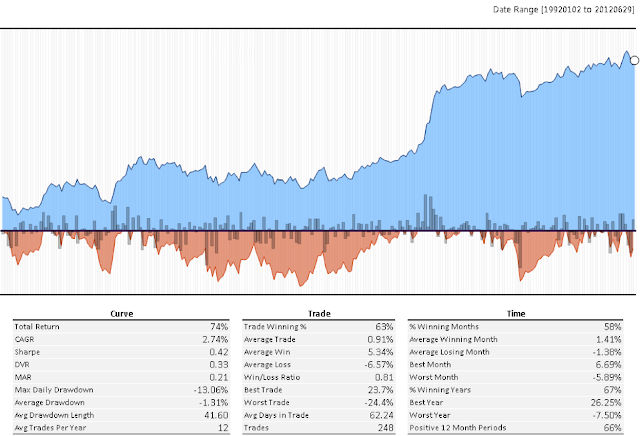 The T-bill allocation is dynamic where cash expands and contracts in the portfolio in order to keep the portfolio volatility close to our 7% target. The Risk Parity overlay delivers a substantial uptick in performance and portfolio stability, as evidenced by the more consistently upward sloping equity line. Absolute portfolio performance increases substantially, as does the Sharpe ratio, which is double the Sharpe of the original portfolio. Higher returns are accompanied by a lower drawdown as well, under 12%. 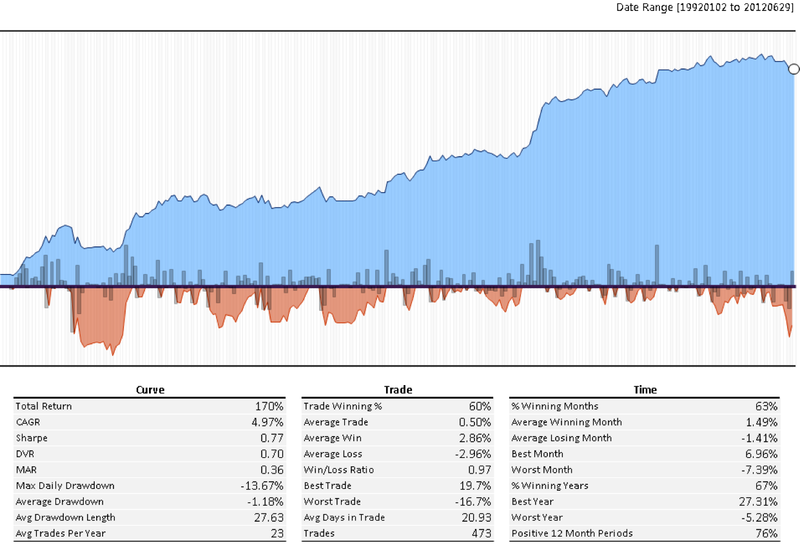 Risk Parity also improves the percentage of positive rolling 12-month periods, which we take very seriously as a measure of consistency. The large improvement from Risk Parity is clearly the result of the fact that risk parity approaches tend to greatly overweight bond positions, given the low volatility of bonds relative to stocks and gold. Japanese bonds were the best performing of the four asset classes over the period. The 10-month moving average overlay does improve absoute returns and volatility, but at the expense of a larger drawdown, which is higher even than the 22% drawdown experienced by the original Japanese PP. 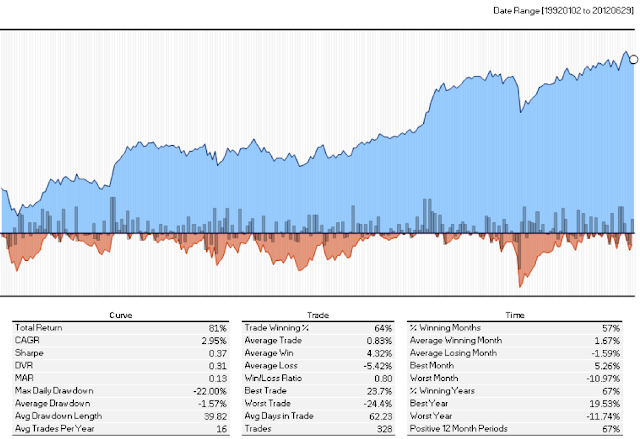 The last approach marries Faber’s tactical overlay with a portfolio risk target of 7%. This approach delivered the best risk-adjusted performance for the U.S. model, so we were quite interested in how it would work in Japan. The target volatility technique performs similar magic in Japan as it did for the U.S. PP, though the absolute numbers are still not nearly as good. Returns of 5% annualized are 40% higher than the original Japanese PP portfolio, and risk-adjusted returns are more than double, with a Sharpe of 0.77 compared with the original portfolio’s .37. 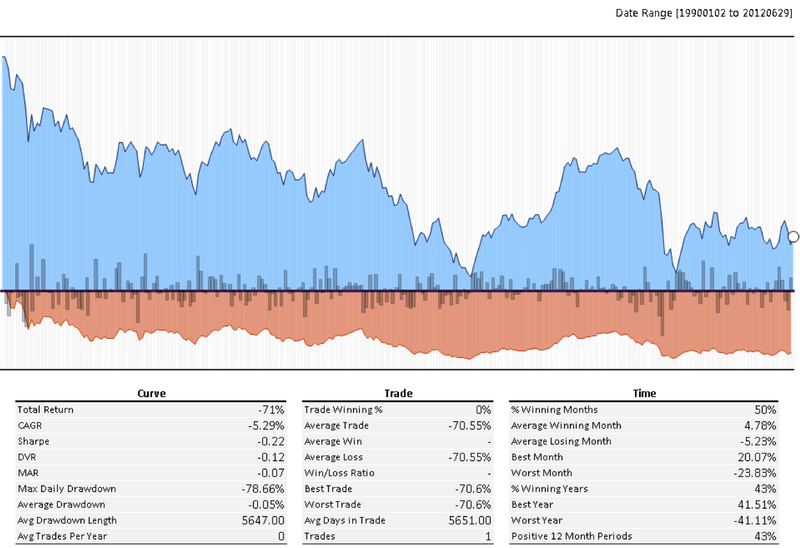 Drawdown drops to a tolerable 13.7% from 22%. The Japanese experience has clearly been very different from the U.S. experience over the past 20 years, as Japan has endured a persistent period of deflationary stagnation while the U.S. has so far experienced growth of both the deflationary and inflationary variety. 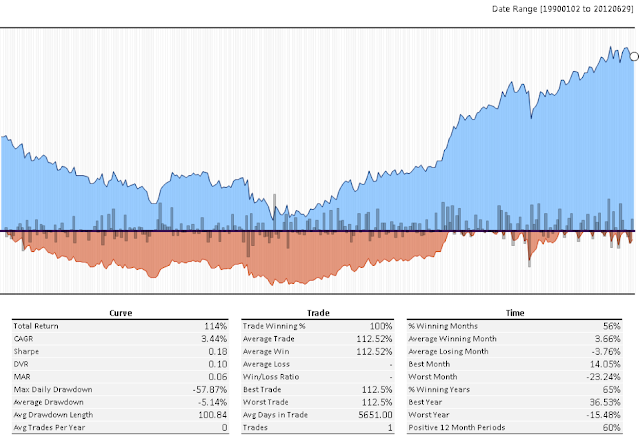 This has had a profound impact on Japanese stocks and bonds, as well as the yen, which in turn impacted returns to Japanese investors from foreign assets like gold.That said, the traditionally implemented Permanent Portfolio would have served Japanese investors much better than stocks on their own, or even a balanced stock/bond portfolio over the past 20 years, with double the Sharpe ratio, higher returns, and much lower drawdowns. 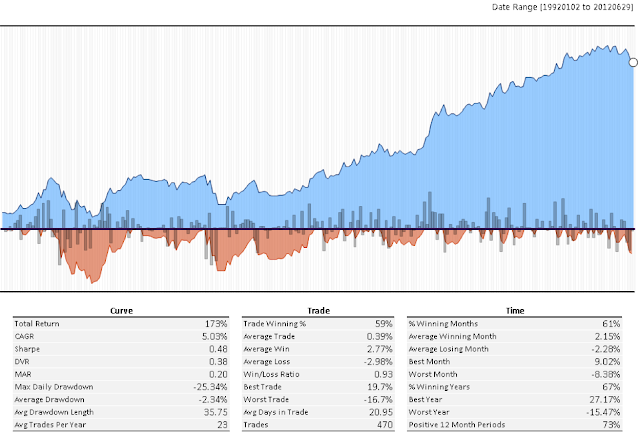 Consistent with our findings in the U.S., techniques that manage the volatility of the individual portfolio holdings and/or target a total portfolio volatility delivered similar or better returns, and for the most part much lower drawdowns. The Risk Parity and Tactical approach with target volatility delivered the highest, most consistent returns with the lowest drawdowns. Overall, passive Japanese investors were better served by the Permanent Portfolio than other traditional asset allocation models over the past 20 years, but even the best tactical and risk management overlays could only produce returns of about 5% per year. U.S. and other international investors might wish to consider this potential outcome in the context of retirement or institutional funding needs.